Shimano XTR Disc Brake Adaptors are the finest disc brake adaptors available for Shimano disc brakes. Utilizing an extremely stiff aluminum construction with a machined-out section in the center, you will achieve your proper brake alignment with a bit of weight savings and a sweet look. 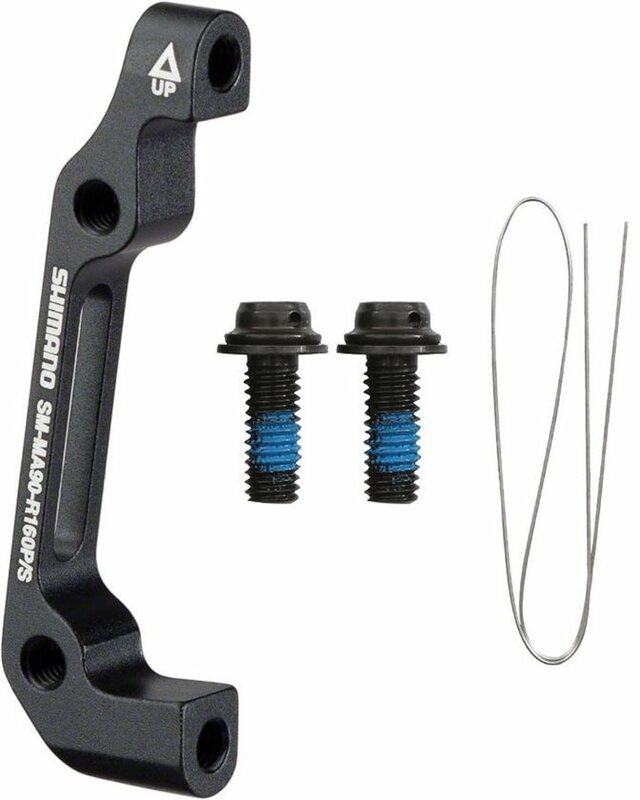 Use only genuine Shimano brake components for the best braking performance. The XTR adapter is a great lightweight upgrade from the stock I.S. to 74mm post-mount Shimano adapters. The fit and finish are of high quality, as expected with high-end Shimano components. I used it to mount Deore XT brakes with no problems while rebuilding an old Trek 8000. I mostly bought it because I could not find the stock one. But the xtr one is lighter than the stock and not too much more expensive so I cannot complain. Once it's on, it stays on. Have had no problems with this product coming loose, even under heavy braking in the mud/wet. Nothing much to say, it does exactly what it's supposed to do. I'll report back if there's a problem. If needing an adapter why not go str, maybe a couple grams lighter than what you would be getting if you decided on something else. Like all XTR parts (except pedals) it is lightweight and does its job well! Quite simply once installed you will never think about this part again. It is significantly lighter than some of the other options out there. this is the most minimal brake adapter I have ever seen and since I was building up a stupid light bike I wanted to get some stupid light bits. This fits the bill perfectly. These l'il jobbers don't cost much, don't weigh much and are super-firm when tightened down. Make sure you order the right one, and make sure you're sent the right one. Ordered a rear brake adapter from Amazon, only to receive a front mount adapter for the wrong size rotor. Can't beat the bike guys for bike parts. The disc brake adapter allowed me to install new XTR disc brake calipers on my wife's favourite KHS cross country Mountain Bike. Happy Wife, Happy Life. Thanks Jenson for the rapid shipment. I recently built a bike and needed an adapter for my rear brake and this one worked perfectly. For less than $10 why not go XTR? Lighter and prettier than other options. Shaves a few grams over the standard version. Oddly I had to add some washers under it to get my pads to the edge of the rotor but I believe that was a frame mount issue (shrunk back from over-weld). This is a quality product and it is fairly light if you are looking to shave grams. It is no frills though. Pretty straight forward. Does this work for any model of Shimano brakes? BEST ANSWER: should fit with any model, but you might have to put some spacers to get the right height. Yes. This adapter is for all shimano branded brakes. Will this fit on a Cannondale m800 with XT cranks?